It's getting to be that time where I need to have a bag packed and in a place easy to grab just in case we have to leave in a hurry. I am going to do this in 3 parts. One for Mommy, Daddy and one if you already have children even if they aren't leaving the house. So stay tuned for the next 2 over the next couple of weeks! Father of the Bride 2 had things going for them. They had the bags packed. I wanted to share my list of things that you want to think about packing in your bag and keep you bag in a place where your hubs and family members who are with you know about so when you do go, it is easy to remember. Or have it tucked away in your room and as your due date approaches move it closer to the garage or front door. What to pack for Mommy: Starting from bottom of bag up. ~Washed blankets from home for baby to get used to smell of home while in the hospital. ~clothing to wear for your hospital stay. 2 tops 2 bottoms (sweat pants again or capris or loose fitting non tight stuff). PJ's would be great, I just choose black bottoms or dark bottoms because of the after birth bleeding that happens, unless you want to wear the hospital gown. ~toiletries- toothbrush, hair brush, hair tie, face wash, shampoo and conditioner, glasses case, contacts and solution and makeup if you so choose. UPDATE* Don't forget to bring a robe with you so you can walk around the hospital if you have to during labor. ~Birthing sports bra or nursing bra- I have a black one that I will use again to give birth in. Keep in mind this one will get messy from when you meet your baby as they will place the baby on your chest or belly when they are born. That is why black. My cousin did hot pink though. ~Chapstick and hair tie easily accessible for use while laboring. You will need it. ~Insurance card, birth plan, pre-registered hospital card, picture ID and list of what you packed to make sure you bring it all home in a file folder so that you can check into the hospital and also add the hospital paperwork to before you leave the hospital too. I am hoping to do most of my laboring at home prior to the hospital. And when I get to the hospital I want to be all work no play basically. But if getting induced, bring a good book or crossword puzzle or a game with you and make sure you rest because inductions can take some time and it can get boring just sitting there watching the clock, which you will do even if you bring a book, game or rest. I also bring essential oils with me to help calm me or help me through the labor. My doula and hubs will administer them to me during labor. But these are my essentials. If I think of anything else to add between now and DD I will update this post! 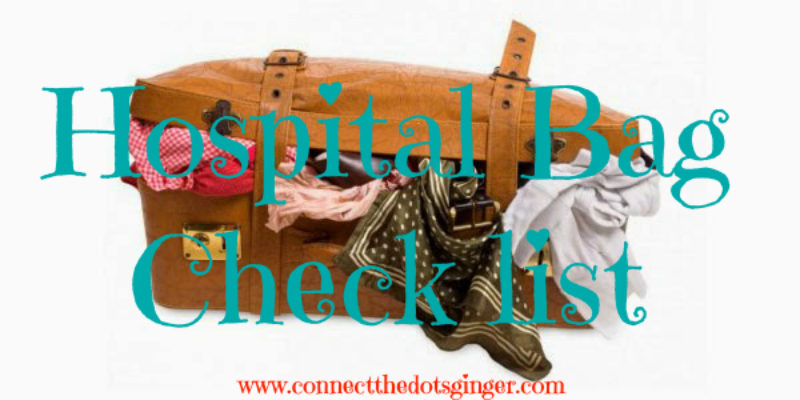 QOTD: What do you think is the most essential thing to pack to the hospital? Want to know what to pack for your hubs? CLICK HERE! Want to know what to pack for your kids and pets? CLICK HERE!